If you're allergic to silver or shiny things (or photos of people wearing silvery-shiny things), read no further! Haha. Comedic genius at its finest. Quite the relatable teen jokester I am. I'll be here all week, folks. Alternate joke idea: the Met Gala this year must have really been a great party because all the celebrities dressed up like disco balls! Am I right or am I right?!?! Sigh. But seriously, the Met Gala red carpet last night was practically dripping with silver by the time all the exclusively-invited guests made their rounds. For rightful reason, though, because what other occasion warrants one to dress like the A-List, Balmain-donned version of WALL-E besides one with the theme of "technology"? Well, "Manus x Machina: Fashion in an Age of Technology," to be exact, but tomato/tom-ah-to, right? (This is me trying to be funny to make up for the fact that I don't have the mental resources to write an intelligent paragraph on the depth of this theme). Let's get to the freaking out over beautiful works of art, shall we? ALEXA CHUNG, MY MOTHER!!! I think she looks awesome. Her jeweled up suit looked fun and edgy while simultaneously sophisticated. 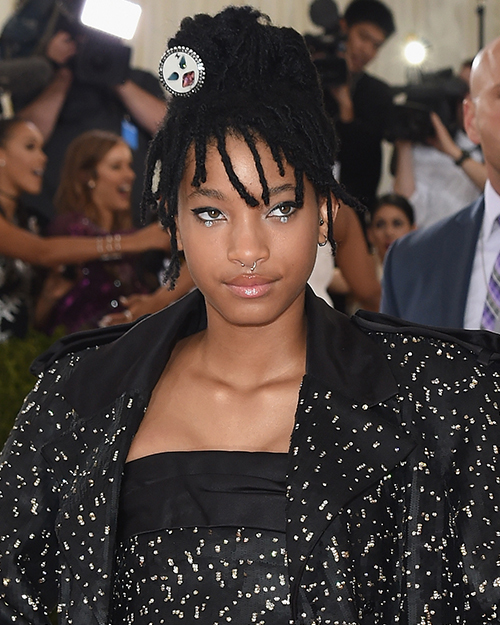 While I'm always up for taking the road less-traveled with outfits, the Met Gala is such a fancy event that sometimes a pantsuit or mini dress can just seem wrong- however, I really think Alexa's look was right. Speaking of mini dresses, here's Alicia Vikander! On this particular instance, I think she did the short dress thing well. Knowing me, I gravitate towards maximalism- and this look has A LOT going on while somehow still looking like a cute mini "put it on and go" type of thing. The colors look cool together and the shoe choice was SUCH a yes- I think I would like the look less if it was paired with simple black heels. I think the full look is really cool and the boots make it. Her face, hair, and figure look beautiful, too!! The more I look at it, the more I like it. (A lot of the Louis Vuitton crew last night was wearing cool chunky boots and I'm in love, just wanted to put that out there). Taylor Swift's look was one of my least favorites. She did seem to be following the theme with the futuristic silver shininess, but something about the silhouette of the dress seemed wrong. Maybe it would have worked better if it was longer? Speaking of Taylor Swift, let's talk about her girl squad! Karlie Kloss looked beautiful because she is a beautiful, beautiful woman. Everyone on the carpet is beautiful, for that matter!! However, my picky "maximalism but only when it works" taste is urging me to deem this look a bit predictable. Of course she looks beautiful and elegant (the removable cape is cool), but I can't say I was absolutely floored or call this look a "work of art." HAIM was AMAZING!! They looked so great as a group. The hair accessories, the dresses, the everything- so awesome. They look just like Rodarte models. Kendall Jenner also looked absolutely stunning because, well, when does she not? Her dress looked great on her (the blue crystals are quite pretty) and her makeup was perfection, but I feel like it's missing a bit of wow-factor, at least for my taste. Writing these red carpet round-up posts continue to make me more acutely aware of how picky and unidentifiable my "taste" is, but that's what I think as of right now, May 3rd at 4:34 PM!! The same goes for Gigi. She looked pretty and I guess I liked the look, but that's all I have to say for some reason. Side note: She did have a lovely date there with her, Zayn Malik, whom I chose not to picture out of my own spite because I wish I were in Gigi's place. I love maturity. Gigi's sister, Bella Hadid, also looked beautiful- not necessarily overly on theme, but anything with a pretty train gets bonus points from me. I'm a bit tired of Bella wearing black to everything, but it looks amazing on her, so no harm, no foul! It looked classic and gorgeous. Lucky Blue Smith and Pyper America Smith KILLED IT. I was so happy to see them there because I have a huge crush on both of them, to be honest. I just love Lucky so much and Pyper's pink hair and unique alien-esque look has me rooting so hard for her in her modeling endeavors. I love Pyper's whole dress, train and all, and her hair color and hairstyle looks AWESOME with it. More of my personal favorite looks came from another sibling duo, Jaden Smith and Willow Smith. More details from Willow's look. SO good!!! The septum ring, eye gems, and silver earrings are edgy yet seem to go perfectly with her sophisticated look. I am LIVING for this. Also wearing Chanel was Lily Rose Depp. If this year's theme translated to "shiny and silver," she didn't necessarily adhere to the theme, but I still think she looks absolutely beautiful. The silhouette of the dress looks really cool with the Chanel bomber jacket (what a unique piece) and her not-too-harsh hairstyle was a good choice. I might just be biased because I love her, but that's my verdict! 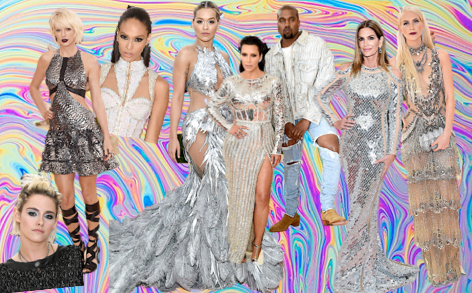 LOTS of people wore Balmain- and while they all looked beautiful, they all kind of looked the same to me. Whether that's a bad thing or not, I'm not sure, but each dress (and woman) was shiny and glorious, so I'm just going to leave it at that. Also very silver and very shiny was Rita Ora, who I think looked amazing. I'm really inconsistent with my thoughts towards Rita's style, but last night I think she got it just right: she brought the drama while following the theme and kept it looking put-together. Poppy Delevingne's look was pretty cool- her sleek hair looked awesome and I love the layered ruffle look of the bottom part of her dress. Maybe a middle part or slicked back hair would work better with the look, though. I'm not exactly sure how I feel about Ciara's dress itself but all I know is that she pulled it off really well. 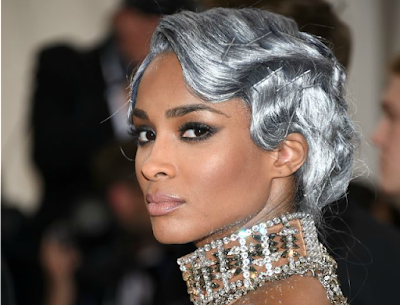 The color of her hair was the best part for me- now that's real silver hair, not just gray! It's so shiiinnyy, I can't look away from it. Some looks that were a little too underwhelming for me were those of Rosie Huntington-Whitely, Kate Upton, Emily Ratajowski, Lily Collins, Amy Schumer, Mindy Kaling, Margot Rubbie, Taylor Hill, and Ivanka Trump. Maybe it's just something about solid colors? Well, I don't think that's it, because I liked Bella Hadid's all-black ensemble. 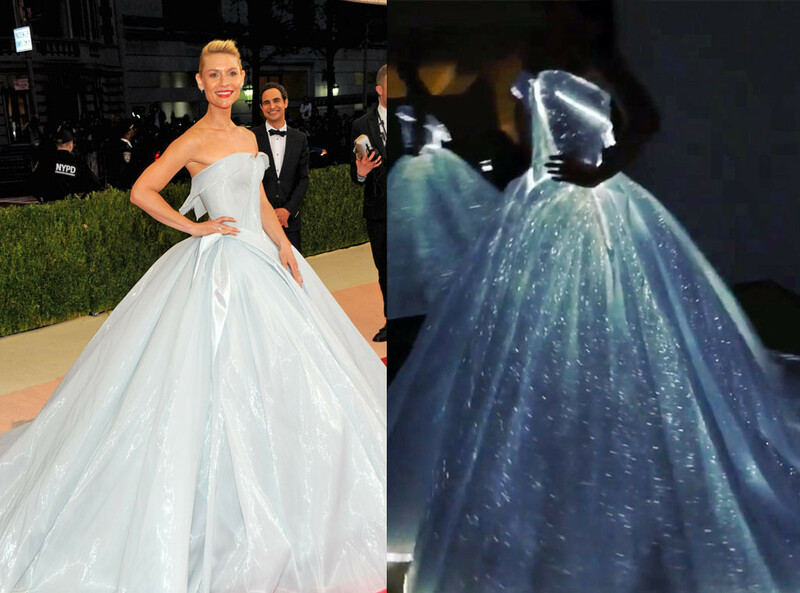 I don't know, I just feel like these looks lacked drama and the Met Gala is for drama! All beautiful women, just a little too simple for the Met Gala. Blake Lively didn't seem to be an ounce on theme, but she still looked so pretty and definitely brought the drama. The earrings and the train made the look- super elegant but still unique!! I think this look was one of my favorites because she stayed true to her personal style but still brought the drama that the Met Gala calls for. And of course I have to address Beyonce's look. I don't really have much to say besides the fact that I'm not a fan of it- the whole look just seemed a bit off. Am I missing something?? I don't know. Sorry, Bey. Okay, I know I'm skipping tons of attendees, but my nit-picky opinions should only drag on for so long. I just wanna end with how GREAT Florence Welch looked. 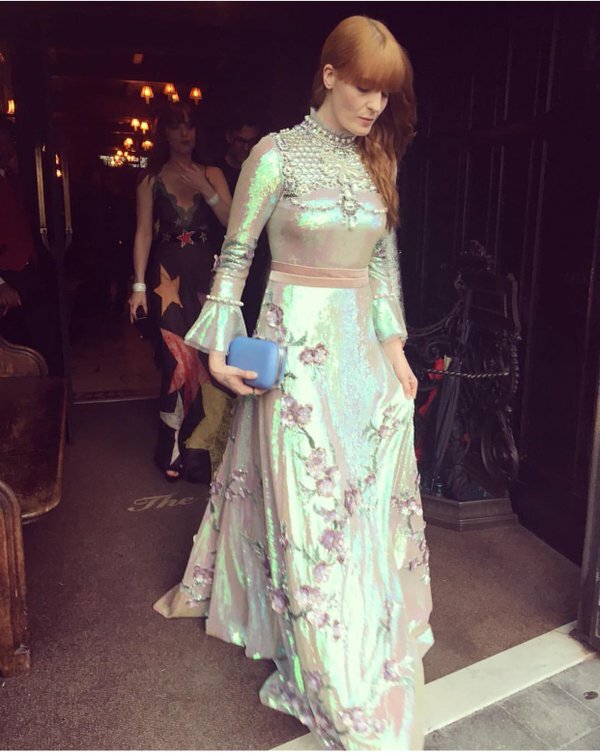 This Gucci dress defines the word "iridescent" and she looks like a beautiful futuristic fairy. The way the dress reflects is SO cool- is it silver/pink, silver/blue, or silver/green? It's all of them! I'm in love. 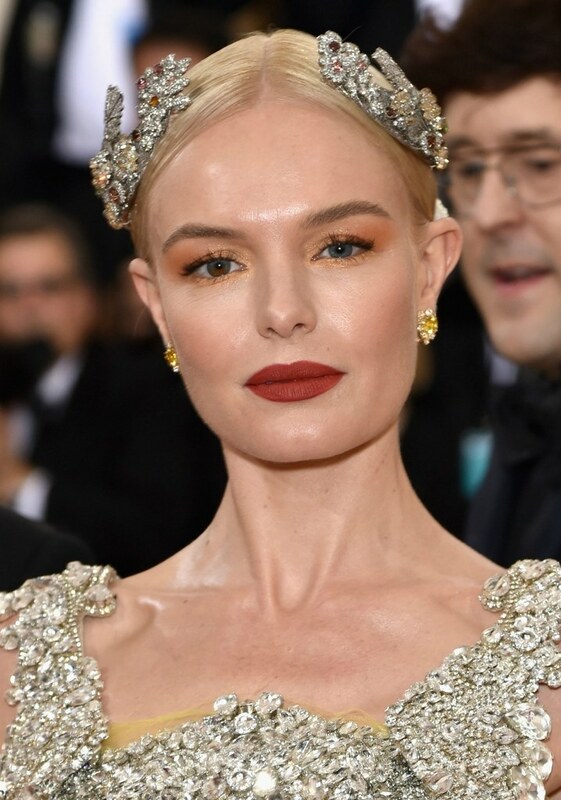 Kate Bosworth looked like a delicate doll and her hair pieces were beautiful. What were your favorite looks from last night? Let me know in the comments if I missed any! (All photos are not my own, obviously, and all opinions are indeed my own- but they're only opinions, so take them as you will).